Imperium Caroli Magni occidentis Imperatoris complectens Galliam, Marcam Hispanicam, Baleares insulas, Corsicam, Italiam Vulturnum usque et Ausidum fluv?, Istriam, Liburniam, Dalmatiam, Rhaetiam, Vindeliciam, Noricum, et quidquid Germaniae a Rheno ad Oderam usque et Mare Balticum, protenditur. This is a beautiful 1752 map of Europe and the Empire of Charlemagne by Robert de Vaugondy. It covers Europe and the European Empire of Charles the Great from England south as far as northern Africa and from Portugal to the Baltic Sea in the east. The map is highly detailed, noting several towns, rivers, islands and other topographical details. After ruling and reforming France in 768, Charlemagne conquered Italy and, in 800, was crowned Holy Roman Emperor. For the next 14 years until his death, Charlemagne's empire untied much of Western and Central Europe for the first time since the collapse of the Roman Empire. The 'Carolingian Renaissance' witnessed a catholic themed revival of art, religion and culture, encouraging the formation of a common European identity. The map includes a beautifully engraved title cartouche in the top left quadrant. 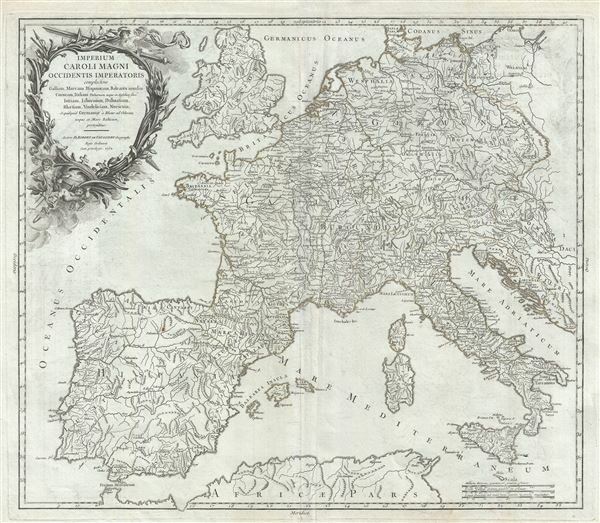 This map was drawn by Robert de Vaugondy in 1752 and published in the 1757 issue of his Atlas Universal. The Atlas Universal was one of the first atlases based upon actual surveys. Therefore, this map is highly accurate (for the period) and has most contemporary town names correct, though historic names are, in many cases, incorrect or omitted. Rumsey 3353.012. Pedley, Mary Sponberg Belle et Utile: The Work of the Robert de Vaugondy Family of Mapmakers, 93 state 2.